Divorce can be a very difficult time for anyone, with the emotional stress of splitting with your partner, comes the division of finances, and relocation of where you live if you have to sell your property etcetera. It is easy to think of how difficult divorce would be emotionally, and sometimes that can overshadow the stress it might also place on you financially. In this article we aim to help ease the financial stress that might be placed upon you in the situation where it is possible. In such a difficult time, you will need to seek help from friends and family. Some people find it hard to seek help, and bottle up a lot of their thoughts and feelings on the matter. It can even be down to needing somewhere to stay for a night, or simply needing some company just to be able to take your mind of things. Your friends and family can be your first port of call, this is important that you utilise people who will offer you help, as every little bit of help will guide you through the process more smoothly. Another step that you might have to take during divorce is the process of selling your home. If you are required to sell your house at some point within your divorce it is important that you don’t rush the procedure. As painful as it may be, moving out of your beloved home with all of the memories you have made there, it will also be a part of you moving forward and past this point in your life. Although that might sound like more of a reason to up and out of there as quick as possible, it isn’t. You need to ensure that you don’t needlessly sell your house at a lower price than you would otherwise. If it takes you longer, it is still worth making sure you recoup the full value of your property – it is completely wasted money if you decide to do otherwise. In the long run it will provide you more money to land on your feet, rather than leave you regretting losing your money unnecessarily. If there is one way to save massive legal fees, albeit unnecessary ones, for those of you capable and confident it is to do the legal paperwork by yourself. For those of you that are confident in your own ability there are ways to do the paperwork by yourself, obviously some of you might feel that you need the help or advice of a professional. To find out more about what legal documents you would need to take care of, companies like Rix and Kay from Sussex and Brighton offer free consultations where you can find out valuable information for free and you don’t even have to use them after. Other places that can be useful for information are the websites of law firms like Neves Solicitors from Milton Keynes Knocker & Foskett from Kent and Ashley Wilson Solicitors from London– these sites offer you more information free of charge so you can improve your own knowledge and you know its correct. Finally, make sure you access your options when it comes to divorce. 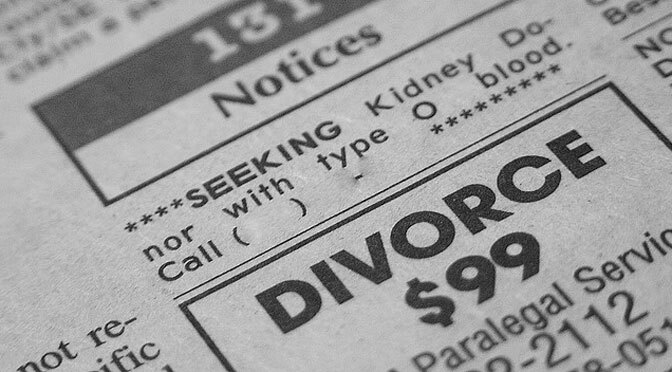 There are many ways you can approach divorce, some more financially viable than others. Choosing the correct form of divorce can save you time and money, it will ease the stress on you and can make the process more pain-free. If possible, try to work with your partner to make sure that the separation is as pain-free as possible, obviously if you two encounter disputes it becomes a lot more expensive if they have to be settled in court.